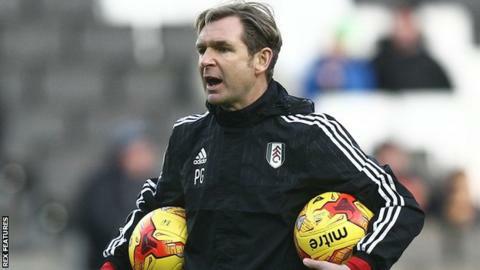 Fulham caretaker manager Peter Grant insists he has the quality to guide the side while the Championship club search for a replacement for Kit Symons. The 50-year-old former Norwich City boss was placed in charge of training on Wednesday and oversaw Saturday's 1-1 draw at MK Dons. Last week, Reading's Steve Clarke turned down the opportunity to replace Symons, who was sacked on 8 November. "I have got the experience and am confident enough," Grant said. Mike Rigg, chief football officer at Craven Cottage, is heading the search for a new manager after chairman Shahid Khan decided to sack Symons following a 5-2 defeat at home by Birmingham. Grant left Norwich in October 2007 following a year in charge of the Canaries and has since had spells on the coaching staff at West Brom, Celtic, Birmingham, Aston Villa and Nottingham Forest. He joined Fulham as first-team coach in summer 2014 under then-manager Felix Magath, but then became Under-21 boss following the German's sacking that September. "My role is to help out at this moment while the club search to pick the right man for the job," Grant told BBC Radio London. "They are working diligently to do that. If that takes a little bit longer, so be it. "I am more than willing to help out as long as Mike and the chairman are happy." With Alan Curbishley, Mark Pembridge and Sean Reed previously in charge of training following Symons' departure, Grant said it had been a "whirlwind" few days since taking over. "I was very conscious of not changing too much," he added. "The boys have been very respectful and their attitude has been excellent. If I am still in charge for the next game I look forward to working with them." Fulham, who are 12th in the Championship table, host Preston on Saturday.